Mergers and acquisitions represent a successful growth strategy for many companies, but, while potentially profitable, M&A transactions are complex and often risky. Covering the latest trends, developments, and best practices for the post-Madoff era, this comprehensive, hands-on resource walks readers through every step of the process, offering practical advice for keeping deals on track and ensuring post-closing integration success. 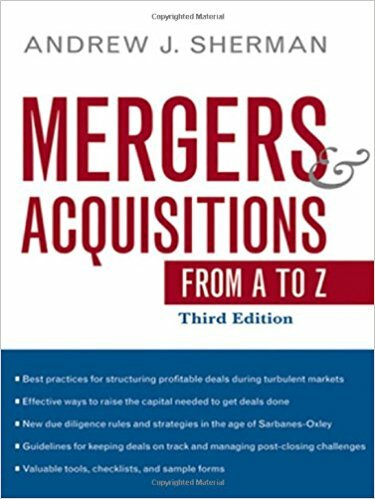 Filled with case studies and war stories illustrating what works and why, the third edition of Mergers and Acquisitions from A to Z offers valuable tools, checklists, and sample documents, providing crucial guidance on: preparing for and initiating the deal; regulatory considerations; due diligence; deal structure; valuation and pricing; and financing even during turbulent market conditions. M&A transactions can quickly spell a company’s doom if they are not conceived and executed carefully, legally, and sensibly. This is the classic guide to mergers and acquisitions, now completely updated for today’s market.